Is this a sick April fools joke, or is it reality? 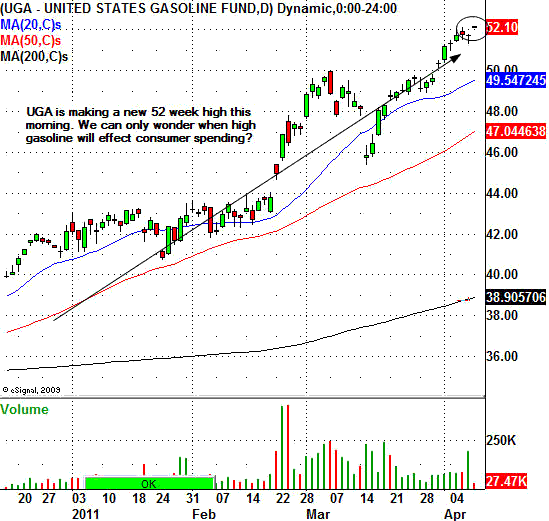 The United States Gasoline Fund (NYSE:UGA) is making a new 52 week high this morning and the major stock market indexes around the world are all trading higher. At some point the high gasoline prices will certainly take it’s toll on the U.S. consumer. Please remember that consumer spending in the Unites States accounts for 70.0 percent of the U.S. gross domestic product. The average price of gasoline in the United States is $3.74 a gallon. Last week the average price was $3.60 a gallon in the United States. Gasoline prices in California are well over $4.00 a gallon at the moment. Please remember that the state of California is the eighth largest economy in the world. The United States Oil Fund (NYSE:USO) is trading higher by 0.37 cents to $44.36 a share. This is a new 52 week high for the USO. WTI crude is trading at a new 52 week high as well. WTI oil is higher by 0.80 cents to $111.12 a barrel. One would have to think that high oil prices will eventually take it’s toll on this inflation driven economy.